To those who know me, my whiskey preferences are no real secret—I’m primarily a drinker of American bourbon and rye. However, as time goes by, I find myself drifting slowly but surely across the sea. Not necessarily to Scotland—as my palate seems to be unusually sensitive to smoke, I still struggle with many overpeated scotches—but instead to the Emerald Isle, and its newest generation of modern Irish whiskeys. Here, I’m increasingly coming to terms with just why American drinkers still mainline an obscene amount of Jameson each year—it’s because Irish whiskey, at its best, is a uniquely inviting and friendly spirit. The thing about Irish whiskey, though, is that like scotch, you often have to be prepared to pay a steeper price for the experience. Whereas $25 can buy you a very solid bottle of bourbon just about anywhere in the U.S., in terms of Irish whiskey that still puts you solidly in Jameson country. If you’re prepared to drop $50 or so, though? In that case, the landscape gets a lot more interesting. So it is with these two bottles from Egan’s Irish Whiskey, via P&H Egan Ltd in Tullamore, Ireland. Offering a 10-year single malt and a second “Vintage Grain” single grain whiskey without an age statement, the two products offer two profiles that share a few similarities but also have their share of differences. But first, to clear up an obvious question, and because American consumers as a whole really aren’t well versed in this vocabulary: What’s the difference between “single malt” and “single grain”? In short, the word “single” in both “single malt” and “single grain” means simply that all the distillate in the bottle came from a single distillery—thus, it is not a blend from multiple distillers. This is true of both bottles. “Malt” means that the whiskey was distilled from 100% malted barley, and no other types of grains. This typically implies the types of rich, sweet, honeyed flavors we associate with scotch. “Grain” whiskey, on the other hand, means that the product is not 100% malted barley, and indeed may not be made with barley at all. It can contain some barley, which may or may not be malted, but it may also contain wheat, corn, rye or anything else you can distill. This doesn’t necessarily imply lower quality, per se—it just means not to expect the distinct flavors of malted barley. Got it? Good. Let’s get to reviewing. This bottle of single grain whiskey (92 proof) doesn’t have an age statement per se, but it says on the website that it was “casked in American oak bourbon barrels for a minimum of eight years,” so apparently it’s just a couple of years younger than the single malt. Likewise, it doesn’t say anything about how the mash bill might vary from its single malt brother, but the differences between the two become apparent in tasting. Just visually, it’s clear that the two are not the same, as the Vintage Grain is a couple of shades lighter—yellow vs. gold in color. On the nose it’s pretty light, with notes of green apple, honeycomb, florals and a whiff of slightly fusel alcohol. On the palate, however, this is an interesting product. It’s significantly more spice-forward than the single malt, quite peppery, with complementary grassy and fruity flavors. Green apple and light caramel/toasty notes are met by a lot of floral impressions, but overall it feels younger than its brother, and most tasters would likely come to the same conclusion. It also seems slightly hotter to me, with a more aggressive burn, but that impression is amplified by the peppery nature of the spice profile. Of the two, the Vintage Grain is likely to be the selection more familiar to drinkers of American whiskey—and specifically rye whiskey, actually—but it seems to me that if you wanted that profile, you’d probably just be drinking something American. All in all, this is intriguing, but I’m not sure it can specifically justify its $45-50 MSRP. I will say this for it—of the two, it’s probably the one that would be more interesting in cocktail applications, thanks to the spice and drier profile. If you’re going to drink Irish whiskey, this is much closer to the profile you’re probably expecting—sweet, rich, honeyed, caramelized, fruity and more complex than one might think at first glance. 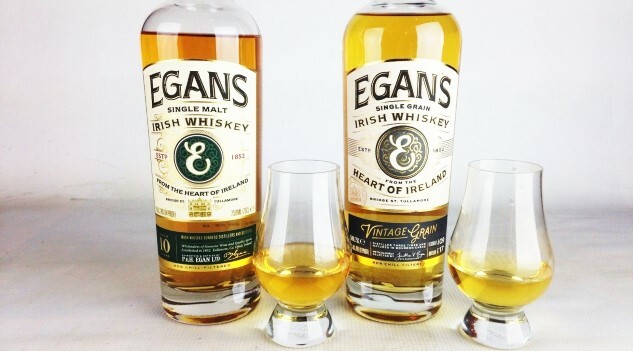 The 10 Year Single Malt from Egan’s leans more toward richness than the prevalent spice in the Vintage Grain, with a deeper and more winey/vinous profile. On the nose, a greater degree of sweetness/richness is immediately apparently, with lots of honey and fresh cut grass. On the palate, the character of the caramel here is deeper and fuller, with some clove/caraway-like spice but not much of the pepper of the Vintage Grain. Vinous wine grape notes give way to significantly more oak/wood character, which also enhances its notes of vanilla and also reminds me a bit of apricot-esque stone fruit. Another result is that the alcohol presence (actually slightly higher at 94 proof) is a bit more integrated and hidden. All in all, I find the 10 Year Old Single Malt the more rewarding of these two bottles, especially from a neat drinking standpoint. You might throw a cube of ice in this, but it drinks very well all on its own, and that’s likely the best way to consume it. If you’re a fan of the classical flavor profile of Irish whiskey, it’s hard to imagine you won’t enjoy this. It just about justifies (or comes close to justifying) a $50-60 MSRP.